COLLEGE PARK, Md. – For years, scientists have recognized that the mechanical interplay between a cell and its surrounding microenvironment influences how tumors progress and spread to new areas of the body. 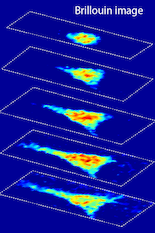 But, measuring this interaction poses challenges, as traditional techniques to study cell properties either require contact with cells – which prevents measuring cells while they are within tissues – or produce images with limited resolution. Recognizing this, University of Maryland Fischell Department of Bioengineering assistant professor Giuliano Scarcelli led the development of an optical microscopy technique that can be used to help measure mechanical properties of biological tissue and cells without contact. The technique relies on a process called Brillouin light scattering, whereby light interacts with density fluctuations in a medium allowing researchers to measure how mechanical properties of a cell change over time in their 3-D microenvironment. Along with members of his Optics Biotech Lab, Scarcelli is now working to apply Brillouin optical microscopy to shed light on how and why tumor cells spread – or metastasize – to other parts of the body. The team’s efforts could lead to a breakthrough for cancer research, as scientists have long searched for ways to gather more information – and clearer images – to study the biomechanical properties of cells in 3-D environments. The Innovative Molecular Analysis Technologies program of the National Cancer Institute of the NIH just awarded Scarcelli and his team a $1 million research grant to support this work. In order for cancer to progress from one area of the body to another, a tumor cell leaves the original cancer site through a complex process known as the metastatic cascade before a new tumor forms at a secondary organ site. But, scientists still are still searching for answers to critical questions about the various steps involved with metastatic cascade: How does a tumor cell decide to metastasize to a certain organ or organs? And, once the metastatic cascade process has begun, is it better for scientists to target therapies to tumor cells in transit, or to direct therapies to the secondary site(s) to which the cancer spreads? When that insight comes, Scarcelli hopes that it will expand scientists’ understanding of how a tumor cell accomplishes the steps of the metastatic cascade. This, in turn, could help bioengineers develop improved diagnostic tools or improved drug screening platforms, he noted. Scarcelli specializes in biophotonics, with strong emphasis on optical sciences and technology development. Prior to joining the Fischell Department of Bioengineering in 2014, he served as an instructor with the Harvard Medical School and Wellman Center for Photomedicine at Massachusetts General Hospital. He is the inventor in four patents, all licensed to industry, and his work with Brillouin microscopy earned him the Tosteson Postdoctoral Fellowship Award, an NIH K25 Career Development Award, and a Young Investigator Award from the Human Frontier Science Program. Research reported in this article is supported by the National Cancer Institute of the National Institutes of Health under Award Number R33CA204582. The content is solely the responsibility of the authors and does not necessarily represent the official views of the National Institutes of Health.